Part 9: What is the biggest risk I face in retirement? Next up: Who can my super go to and will they pay tax? Sequencing Risk is risk of negative returns early in retirement. Now let’s understand this graph carefully. Investor A and B both retire at age 65. They have both accumulated $500,000 in super at retirement. 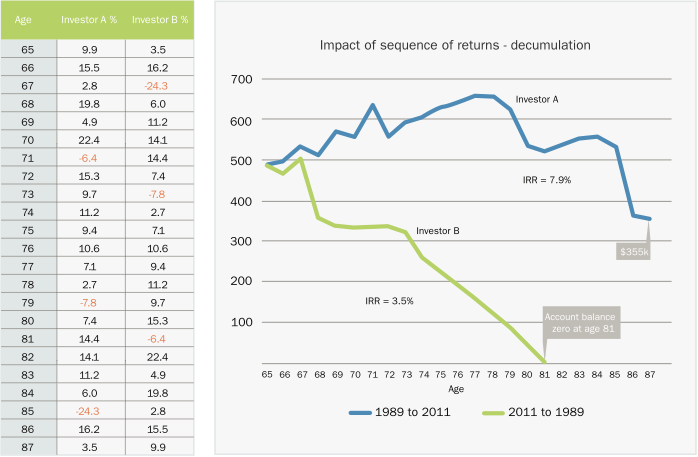 Investor A’s returns are from 1989 to 2011. Investor A has retired in 1989 at age 65, and his life expectancy is 87 years in 2011. Investor B has the EXACT SAME returns but in reverse order – meaning he retires in 2011 at age 65 and experiences the same returns that A did backwards. If you observe the returns, A’s first 4 years are exactly the same as B’s last 4 years. So what are we trying to get at here? Essentially, that the average annual return (add all the returns and divide by total number of years) on both A’s portfolio and B’s portfolio are EXACTLY THE SAME. Then why is the result so different? Both A and B can say they had an average return of 7.98% over the 22 year period! The difference in outcomes is due to sequencing risk. As explained, the risk of negative returns early on in retirement. For investor B, the Global Financial Crisis of 2008/09 occurred in only his third year of retirement. For investor A, this happened right at the end of his retirement life cycle. The massive losses suffered in year 3 were too difficult to recover from for investor B since he was making those losses real every time he took out his weekly or monthly income payment. Sequencing risk has a significant impact on investor B – he runs out of money at age 81 while Investor A has more money than what he started with at that point! So what could investor B do differently to avoid sequencing risk? Try to time the market? It was a one-off event and something like the global financial crisis will not happen again? If you wish to stay ahead of inflation and ensure your funds last throughout your retirement, you will need to find options other than cash and term deposits. 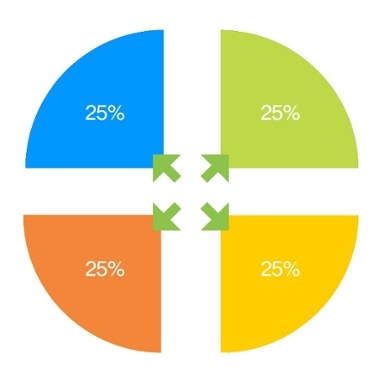 The Ellerfield F.O.C.U.S2 ® program structures your super fund to ensure that income payments can be drawn on a regular basis WITHOUT having to sell units at a bad time. Every client at Ellerfield has his or her own tailored investment strategy for retirement. Sequencing risk is always addressed as part of our strategies. Part 9: Who can my super go to and will they pay tax?